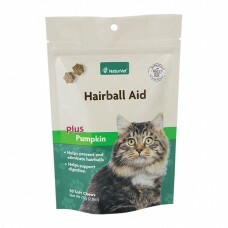 NaturVet Natural Hairball PLUS Vitamins & Minerals helps eliminate and prevent hairballs when used on a daily basis. Added vitamins and minerals provide extra nutrients to help maintain overall health. Oat Groats, Rice Flour, Flaxseed Meal, Lecithin, Dicalcium Phosphate, Psyllium Husk, Ferrous Sulfate, Zinc Sulfate, Calcium Ascorbate (Source of Vitamin C), Inositol, Vitamin E Supplement, Vitamin A Palmitate, Niacin Supplement, Vitamin D3 Supplement, Riboflavin, Pantothenic Acid, Thiamine Mononitrate, Manganese Sulfate, Pyridoxine Hydrochloride, Cobalt Carbonate, Copper Carbonate, Vitamin B12 Supplement, Potassium Iodide, Folic Acid, Natural Flavoring, Vegetable Oil, Cod Liver Oil, Sorbic Acid, Glycerin, Wheat Germ and Brewer’s Yeast.